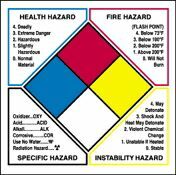 Title: 06/17/1996 - Requirements for Reporting Health Hazard Information on a Material Safety Data Sheet (MSDS). Thank you for your letters of February 19, March 4, and March 18, to the Occupational Safety and Health Administration (OSHA) regarding the Hazard Communication Standard (HCS)(29 CFR 1910.1200) requirements for reporting health hazard information on a Material Safety Data Sheet (MSDS). Specifically, you asked whether preliminary health effects reports filed under the Environmental Protection Agency (EPA) Toxic Substance Control Act (TSCA) Section 8(e) notification of substantial risk requirements must be included on an MSDS, or whether the information may be omitted from the MSDS until final submission of the completed study. According to paragraph 1910.1200(d)(2) of the HCS, chemical manufacturers evaluating chemicals must identify and consider the available scientific evidence concerning chemical hazards. For health hazards, evidence which is statistically significant and which is based on at least one positive study conducted in accordance with established scientific principles is considered to be sufficient to establish a hazardous effect if the results of the study meet the definitions of health hazards in the standard. The mandatory Appendix B of the HCS further states that the results of any studies which are designed and conducted according to established scientific principles, and which report statistically significant conclusions regarding the health effects of a chemical, are sufficient basis for a hazard determination and must be reported on the MSDS. EPA's TSCA 8(e) reporting requirements are distinct from those of OSHA's HCS, and therefore, are independent requirements. However, as you noted in your letter of March 18, a TSCA 8(e) notice of substantial risk is required where available information "reasonably supports the conclusion that [the] substance or mixture presents a substantial risk of injury to health or the environment." Where these conclusions are supported by evidence that is statistically significant and based on at least one positive study, the effect must be reported on the MSDS. In any case, it is the responsibility of the chemical manufacturer or importer to evaluate the available studies and determine whether the results of these studies must be reported on the MSDS. We hope that this response provides the clarification you need. If you have further questions, please contact our office at (202) 219-8036. 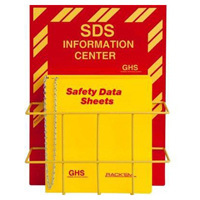 Teach your employees about MSDS's with posters and pamphlets from Safety Emporium. I would like an interpretation on whether health effects reports filed under EPA TSCA Section 8(e) requirements need to be included on MSDSs. For example, if a preliminary TSCA 8(e) study report was filed on a raw material included in one of our formulations would that preliminary 8(e) information need to be given on our MSDS or can we wait however long it takes for the final 8(e) report to be filed (which may end up invalidating the original preliminary data)? To what extent are we obligated to evaluate and report potential health effects based on preliminary test data from sources such as TSCA 8(e) submissions on our MSDSs? There are at least two conflicting concerns: 1. Ensuring new health effects are reported in a timely manner. & 2. Not jumping the gun by reporting effects based on incomplete data which may need to be retracted later. While Michigan may be a plan state with their own OSHA program, they defer to federal OSHA in regards to interpretations, therefore I am writing your office for an official interpretation. Thank you for your time and assistance, I will be looking forward to your reply. I would like an interpretation on whether health effect reports filed under EPA TSCA Section 8(e) notification of substantial risk requirements need to be included on MSDSs. For example, if a preliminary TSCA 8(e) study report was filed on a raw material included in one of our formulations would that preliminary 8(e) information need to be given on our MSDS or can we wait however long it takes (months/years) for the final 8(e) report to be filed (which could end up invalidating the original preliminary draft report data)? To what extent are we obligated to evaluate and report on potential health effects based on preliminary test data from sources such as TSCA 8(e) submissions on our MSDSs? There are at least two conflicting concerns: 1. Ensuring that new health effects warnings and precautions are reported in a timely manner. & 2. Not jumping the gun by reporting effects based on incomplete data which may need to be retracted later. Basically this is a question of coordination and timing between EPA 8(e) regulations on submitting substantial risk notifications on health effect studies in progress, and OSHA Hazard Communication requirements for reporting or noting health effect study results to users/employees. For Example: A supplier of one of our raw materials informs us that they have been doing a reproductive health effects study on their product (which is used by us as an ingredient at over 1% in one of our products) and that their initial test data strongly indicates it causes birth defects by routes of exposure such as skin absorption, ingestion, inhalation, etc., and that they are going to make an 8(e) initial submission to the EPA under TSCA requirements. Do I wait for the final submission of the completed study before updating my MSDS with a "Contains an ingredient which causes birth defects based on animal test results" or do I update my MSDS at the time of the initial 8(e) submission with a "Contains an ingredient which may cause birth defects based on preliminary animal test results? -OR- Alternatively, do I wait to see if and how they update the health effects information on their own MSDS before proceeding with mine? Does OSHA have an opinion on the appropriate action to take in order to comply with the intent of the Hazard Communication standard? While Michigan may be a plan state with their own OSHA program, they defer to federal OSHA in regards to interpretations, therefore I am writing your office for an official interpretation on this issue. Thank you for your time and assistance, I will be looking forward to your reply. Notice to Administrator of Substantial Risks - Any person who manufactures, processes, or distributes in commerce a chemical substance or mixture and who obtains information which reasonably supports the conclusion that such substance or mixture presents a substantial risk of injury to health or the environment shall immediately inform the Administrator of such information unless such person has actual knowledge that the Administrator has been adequately informed of such information. My question remains: At what point does an EPA 8(e) notification merit inclusion under the potential health effects reporting and warning requirements of the OSHA Hazard Communication standard for MSDSs and Labels?